The 'In the News' routine is one of the most underestimated and under-used routines in magic! It's an incredible and visual trick that is so strong, many use it as a finale to a routine. Perfect for close-up, parlor and stage, it's an effect that should be in every magician's repertoire. Well, we here at PropDog did a lot of research into this gimmick over the last year. We contacted some of the biggest names in magic who perform or have performed this routine and we listened to everything they wanted from this gimmick. We have now come up with what we believe is the perfect gimmick for the 'In the News' routine! So, if you're looking to add a new routine or effect to your performance, PropDog's Drink'in the News gimmick would be a great addition to consider! A great idea would be to use this in conjunction with a Torn and Restored Newspaper Routine. 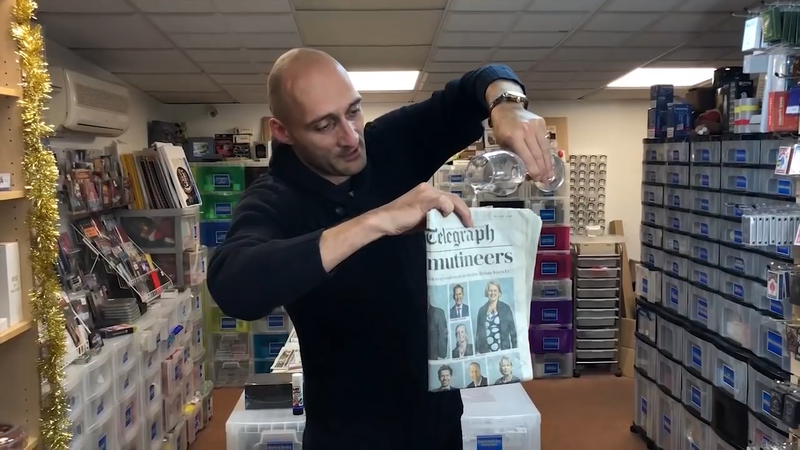 Imagine - You take a newspaper, tear it up, restore it, take a jug of water, pour it into the newspaper, turn the newspaper upside down and nothing falls out. You then open the newspaper, show all the pages, then turn the paper right side up again and pour the water out into a pint glass. You then cover the pint glass with the newspaper, turn it upside down and remove the newspaper and the liquid stays in the glass. You then click your fingers and the liquid falls out into the jug you started with. A great routine for cabaret or stage or that close-up gig, where at the end, they ask you ask for one last trick in front of everybody.